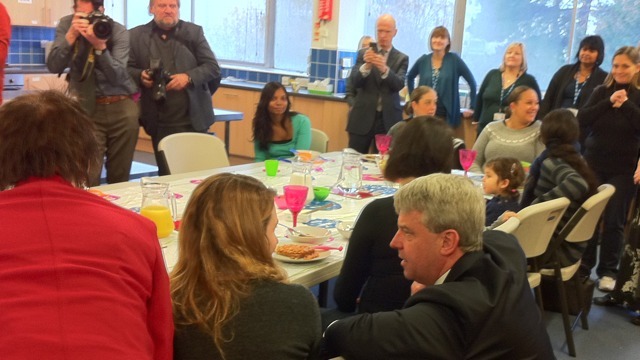 Andrew Lansley, the Secretary of State for Health, came to Wandsworth to launch the public health white paper yesterday. I’ve been very remiss in not posting much about health on here, despite the fact that it’s probably the most exciting area of local government at the moment and presents a huge opportunity for local councils and communities. The main point of the white paper is that public health will soon be a council responsibility again (it was stripped from councils in 1974). It’s a sensible move: it’s commonly recognised that the NHS actually plays a small role in the health of the nation. We might all think of health and think about our GPs and hospitals, but in fact it’s largely a result of our lifestyles and behaviour; the cumulative impact of even small changes (a slightly healthier diet, a little more exercise) would make a huge positive difference to our collective health. The challenge now is how we carry this out and made sure that the decisions the council takes all take account of the public health impact. And the real challenge for (much of) local government will be a new way of working, like any government publication the white paper has a couple of mentions of Big Society, but it also has references to things like nudge and the influence of networks and all three are quite alien to the traditional directive approach of councils. A further challenge will be measuring the impacts. While the white paper hints at how they are going to baseline public health (and offer reward funding for success) it is not specific, and it’s hard to imagine exactly how we are going to measure the impact on things like life expectancy which, by definition, won’t be felt for years. But despite those challenges the collective reforms for health offer the biggest positive change for health and healthcare I’ve ever seen – moving decisions away from a centralised bureaucracy and as close as possible to patients and communities, which is exactly where they should be. Hi James. We are backing the public health white paper as an opportunity to fill in creatively at local level. See our take on it here http://www.publicinvolvement.org.uk/2010/12/healthy-lives-healthy-people-nudge-or-fudge One of the opportunities we could take right now is about adult obesity services. In my view this could be a joint specification and tender issued by the Council and NHS on an any willing provider basis. It would give the new Health and Wellbeing Board something very important to do at an early stage. Locally there is already a good service running with a social enterprise for children’s weight issues (commissioned jointly between health and the Council) and we should be at least as bold with adult weight services.